When you’ve bought a Sig Sauer P938 pistol to defend yourself and your family, you need to take care of it and keep it with you at all times. Nothing helps you do this more than a gun holster, especially an IWB—or inside-the-waistband—holster. IWB holsters are best for people who want to conceal carry their weapon, as only the handle of your gun will be visible above your waistband. This is a popular carry option with many gun owners, and as such there are many holsters available for the Sig P938. Read on to learn more about our picks for the top four IWB holsters of 2018. The sleek, compact Sig Sauer P938 IWB holster by Holster HQ combines elegance and functionality. This is a custom molded holster, which means it fits Sig Sauer’s 9mm micro-compact pistol perfectly. It comes in an understated black color, and is made of durable Kydex—a thermoplastic often used in modern holster manufacturing. The use of Kydex allows for a quick draw and does not lose its shape. Also, Kydex protects your gun from the elements, as it is waterproof. The light-weight design keeps the holster completely concealed underneath your clothing. If adjustability is a concern for you—and it should be—this holster should be your top pick. 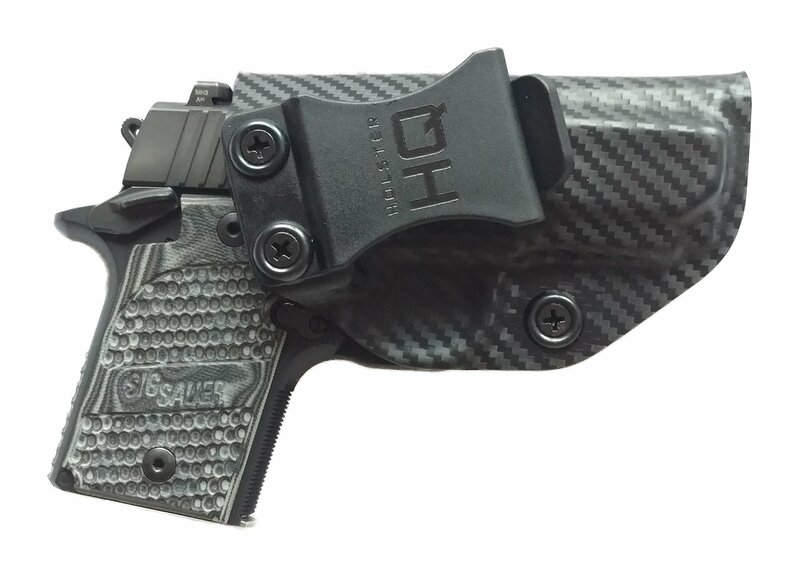 You can wear Holster HQ’s P938 IWB holster in many positions: appendix, hip, and back. Furthermore, the cant is adjustable from 0 to 15 degrees. Finally, you can choose a right or left-handed draw upon purchase. If you are looking for quality in your IWB holster, then look no further than Holster HQ’s model. It is hand-made and double inspected in the United States, which guarantees quality. These holsters are guaranteed for life and backed by a Happy Customer Guarantee. Online reviews are extremely positive. Most people cite the snug fit between holster and gun. With the custom molded Kydex and adjustable retention devices, there will be no chance of your gun moving around in the holster. Obviously, the P938 IWB Holster from Holster HQ works best with Sig Sauer’s P938 pistol. It is custom molded, and so will not work with another make or model gun. If you need a light-weight, concealable, and comfortable holster, then the P938 IWB Super Light-Weight Holster is the one for you. The combination of affordability and high quality can’t be beat, which makes this holster our top pick for 2018. Read more about Sig Sauer P938 IWB holsters. The most classic looking IWB holster on this list, Barsony’s brown leather IWB holster uses brown leather and a pancake style. The addition of a separate brown leather magazine pouch allows you to carry extra ammunition when you conceal carry your pistol. The leather will eventually conform to your body, which makes the material extremely comfortable to wear. Barsony’s IWB Holster is quite light-weight, weighing only 6 ounces, and can be worn on belts with a width up to 1.75 inches. The is some adjustability with this model of holster, but less than our number one pick. You can choose your draw side, both left and right handed options are available. You can also choose to wear the holster in the small of your back. It is recommended that you should buy a left-handed holster if you are right-handed and want to back carry. And, if you are left-handed, you should buy a right-handed holster for back carrying. Barsony makes this holster out of United States harvested double shoulder 7-ounce weight cowhide. It is also hand stitched in the U.S., so is of an extremely high quality.Most of the reviews for Barsony’s IWB holster are positive. 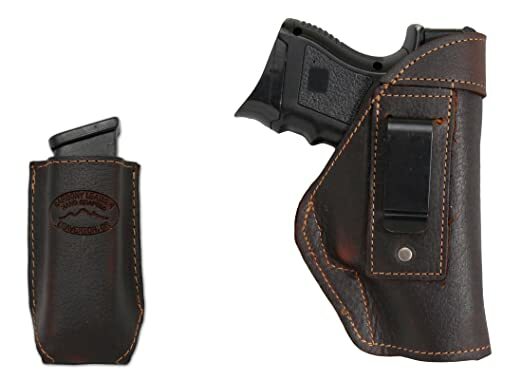 Reviewers cite the comfort of the leather and quality of the materials as the most positive elements of this holster. However, there are some drawbacks. The use of leather means that the holster is not wet-proof and the material will collapse after you draw your pistol. Also, the retention on the Sig P938 is not as tight as with non-leather materials like Kydex. If you have a Sig P938 and are looking for a classic style holster, then the Barsony Brown Leather IWB holster is the one for you. You may also want to consider this holster is you regularly carry extra magazines. It is important to note that the magazine pouch is separate from the holster, so you will need to carry it in a pocket or bag. But, overall, this holster is well-made, comfortable, and affordable, which make it an appealing option for carrying your 9mm. Alien Gear has created an understated and high-quality holster for the Sig Sauer P938 pistol. The hard polymer shell conceals well under your clothes, while the soft CoolVent neoprene base allows the unit to breathe. You can use this product on belts up to 1.5 inches wide. The most adjustable system presented in this review, the Alien Gear ShapeShift Starter Kit includes all the materials needed to carry in four separate ways: IWB, AIWB, OWB belt, and OWB paddle. 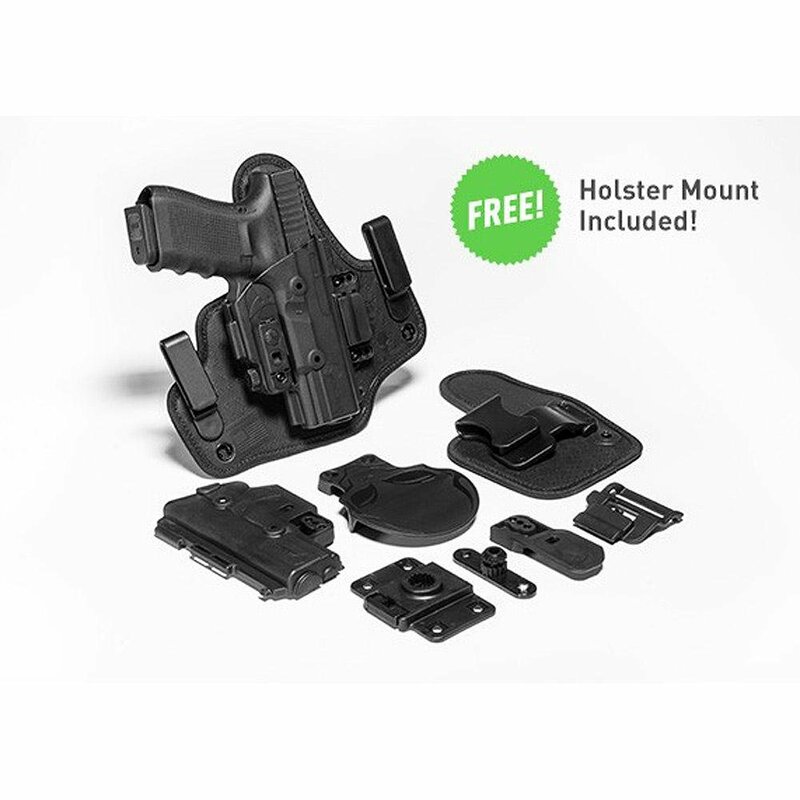 The kit also contains a bonus holster mount that allows you to mount your holster to a variety of surfaces. If this wasn’t enough adjustability for you, you can also decide to use active retention, passive retention, or both. All of the holsters reviewed today are made in the United States. The shell is not hand-made, as in the other holsters discussed here. But, Alien Gear uses a high-quality molding system that delivers easily and securely interchangeable parts. You may want to purchase the ShapeShift Starter Kit if you are new to holsters. It takes a while to find a holster carry option that will work best for you. Alien Gear takes some of the expense and worry out of the trial-and-error process by giving you interchangeable pieces that create four of the most popular holster types for you to try. Winthrop’s IWB holster for the Sig P938 presents another classic look, as it is made from black leather. However, this model does not have the traditional pancake shape, but is custom molded to fit the P938. Custom molding losses some of the “Old Western” appeal of the holster, but provides a more secure fit for your gun. This holster will fit on belts that have up to a 1.5-inch width. There is some adjustability with Winthrop’s Holster, such as the ability to wear it on your hip or appendix. You can also choose right or left carry. However, you must custom order a left-handed holster from the company directly. This holster does not offer a tuckable option. Like the other products presented here, the No Laser IWB Dual Snap Holster is made in the U.S.A. of premium grade materials. 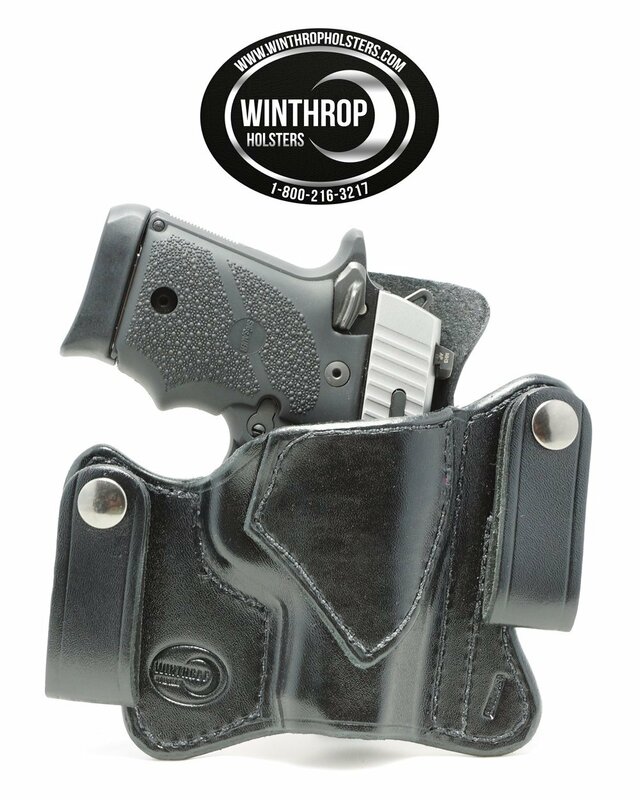 Winthrop uses 7-ounce leather that is wet molded to fit your P938 perfectly, and provides a lifetime warranty. So, if there is ever a problem with the holster in any way, Winthrop will replace it. There is also a 30-day return policy, if you decide that this is not the right holster for you. Reviews are primarily good, with the quality of the leather being often commented on as a major positive. However, this holster can be a little large for some people, especially depending on the way they decide to wear their gun. Also, some people have mentioned that the clear coating for durability occurs on both the inside and outside of the leather. This creates an abrasive surface in contact with your gun, which is undesirable. If you are someone who likes a classic leather holster, but still wants a custom molded fit, then Winthrop’s IWB NO Laser holster is right for you. There are less options than our other three top products. But, for an experience holster owner who knows the style, materials, and type of holster they want, this is not a problem. When picking a holster, you want to make sure that you keep in mind the material that makes it up. Three types of holster materials are represented here: leather, plastic (Kydex), and hybrid. Leather holsters like the Winthrop and Barsony are the most traditional, and for some, the most aesthetically pleasing. These types of holsters will mold to your body over time, but are more susceptible to damage from elements like humidity and wetness. They can also absorb sweat from your body and become itchy. Plastic holsters such as the Holster HQ model are now becoming common because they are extremely durable and can be custom fit to your pistol. These types of holsters can be uncomfortable for some people because of the stiffness of the synthetic materials. Hybrid holsters have also recently risen in popularity. Usually they involve a combination of leather and plastic, but the Alien Gear model combines nylon and plastic instead. The nylon allows for a breathable base, while the plastic mold snuggly against the surface of the P938. This combination of materials can be less durable, however, since nylon tends to wear out faster than plastic. The more adjustable a holster is, the more it can be customized to you. Holster manufacturers will provide adjustments in various aspects of their holsters, including cant, ride height, and retention. Alien Gear is unique on this list, for it offers the ability to adjust the style of holster you use, a feature that is not found in other company’s holsters. Most IWB holsters place the gun at your waist, but some also can be placed on your appendix or at your back. Thus, you will need to ask yourself what hand you plan to use when drawing. The right side of your body is considered the strong side, as most people are right-handed. Keeping your firearm on the strong-arm side is recommended for beginners, as it increases the likelihood of a clean draw. However, some people prefer to keep their gun on the weak side of their body, and use the cross-the-body draw. Where you carry your gun is personal to you, but keep in mind that some companies—Alien Gear’s P938 holster is the example on this list—only offer a right-handed option. Above all, you want your holster to be comfortable. Comfort is quite variable from person to person. Advice from a friend may be useful, but it does not mean that what is comfortable for them will be for you. If the holster is not comfortable, you will not wear it. So, there is no substitute for trying on the holsters before you buy. While Holster HQ’s IWB holster for the Sig P938 may not have the most adjustability or classic look of other models, it does everything well. And it does it well for a very affordable price. This, in addition to the extremely high standards that Holster HQ holds their products—standards they stand by through their warranties—makes the Sig Sauer P938 Holster HQ Super Light Weight IWB Holster stand out above the pack. If you want a great all-around, light-weight, concealable IWB holster, then that is you best option. The other three holsters discussed here also present some great positives. They may not do everything as well as HolsterHQ's model, but are wonderful choices depending upon your needs and wants.